I’m beginning to harvest my sunchokes, which I think are the coolest plants ever, and I’ll give some to anyone who wants to plant them. You can plant them now in Western New York. The only catch is that I don’t want to mail them, so I ask you to arrange to pick them up. If you don’t live near me (I’m in the Eggertsville area of Amherst), you probably work with someone whose cousin lives out this way and can get them to you– Western New York is like that. If you’re interested, email me at connie@buffaloniagaragardening.com so that I can make sure I’m here or have them available for you when you stop by. I think what I like best about sunchokes, also known as Jerusalem artichokes, is that they grow so tall in just a few months. They’ll sprout in April or May and grow steadily over the summer until by August you have leafy plants that are 10 or 12 feet tall. In September the sunchoke will get small yellow flowers, but it’s not a showy plant. It’s a food plant– You can eat the roots. I think they taste a lot like potatoes. I know they don’t look appetizing, but they’re pretty yummy. The sunchoke is a native plant, so it’s easy to grow. They spread readily, so if you don’t harvest them, they could take over your yard. If you find you have more than you need, Friends of Night People can use your extras. See more photos and find out more about sunchokes in our earlier article. If you have gotten sunchokes from me before, I’d love to know how they grew for you. Have you harvested any yet? How did you prepare them? Please leave a comment! Mine grew EXTREMELY WELL (over 12 ft.!). They were well on their way to escaping under the fence into my neighbor’s yard, when I dug them up. So be mindful where you plant them! Do you have any favorite recipes Connie? I put the two you gave me into two larger plastic pots. They got pretty big, but never flowered. I haven’t harvested any yet, because I’m not sure how to store them once I do (tips anyone?!) I’ll give you an update once I do! Here are some great recipes I found, and a great video on how to grow these in pots! I planted them too close to the house, I think, so that they didn’t get much spring rain. They seemed to sprout then disappear. The other possibility was that the rabbits found them. Our rabbits seem to like new growth. Phyllis, I’m glad to hear yours did so well! The other thing people should do when planting is to not plant other perennials around them. I made that mistake. I planted some short things in front of the sunchokes and now I’m stepping on stuff as I try to harvest. I know sunchokes are pretty versatile, but all we’ve ever done with them is slice them thin and saute them in olive oil. I threw in parsley and chives near the end, and my husband sauted them with garlic and onions. But you can roast them and use them in soups or use them raw in salads, too. Rachel, if yours haven’t flowered yet, I wonder if they had enough room in the pot. I’m not sure how long you can store the roots. Certainly you can keep them several days or even weeks if you keep them cool, but they can get kind of soft and less appealing to eat if you store them a long time. Rachel, thanks for sharing that helpful video. 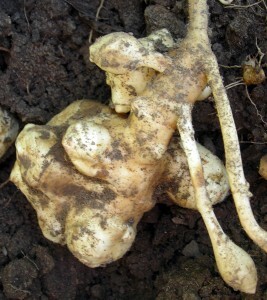 I have left sunchokes in garden beds until I am ready to harvest more, but I like his tip for storing them inside. You harvesting them and store them in a five-gallon bucket, covering them with dirt. Keep in a cool, dry place. I bet that does work much better than sticking them in your refrigerator. Thanks also for the recipes. Linda, I’m so sorry to hear about your disappearing sunchokes! Do you want to try them again? Email me if you do. I remember a plant like this in Costa Rica. They said it tasted like potatoes and I did not like it at all. Maybe it is the way it was cooked, but it made me leery of any root I did not know. Not fond of turnips either. Good to hear there are palatable recipes for the sunchokes. Maybe I should reconsider. Donna, we had Brussels sprouts for dinner tonight. I think those baby cabbages are tasty, but a lot of people hate them. If you don’t like sunchokes, it doesn’t make you a bad person. 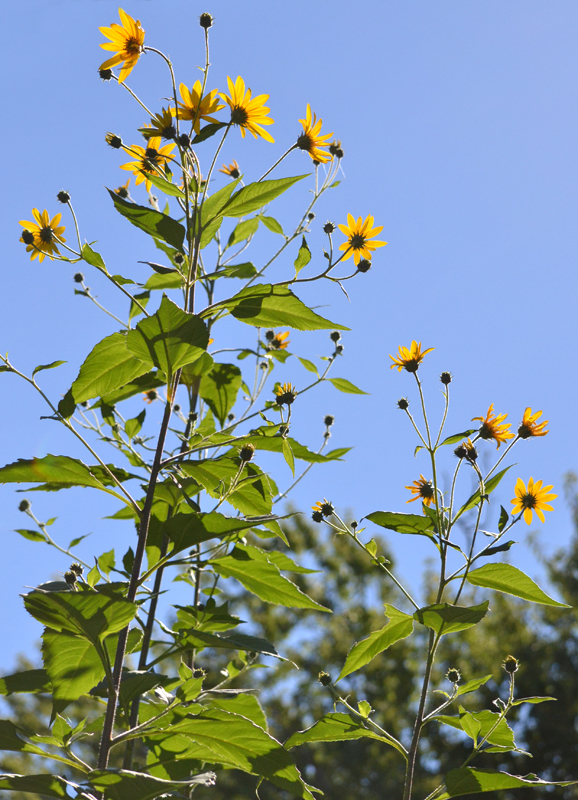 I grow Jerusalem artichokes as well. They have been growing a few years now and have spread. I did this on purpose to form a natural barrier in my backyard. My questions are: Is it safe to eat the older tubers?Can they be eaten after washing with the skins or should they be be peeled first? Or, processed with skins in a food processer? Thanks very much for the great website!! Here’s my response: What a great idea to use sunchokes as a border plant. I find mine give me a little privacy in the summer. Yes, it’s safe to eat the older tubers. They will probably be the bigger ones. The little pieces are too small to bother with and I just replant those. I don’t peel them. Sunchoke roots are very knobby and that would take forever. Just wash them well. If some dirt is caught in the nooks and crannies, slice the root there so you can get at the dirt. Some people scrub them with a vegetable brush. 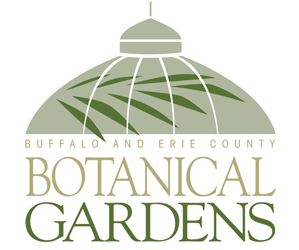 Thanks for the kind words, and please tell your gardening friends about Buffalo-NiagaraGardening.com! I got some tubers from you (Connie) last year. Some grew and some didn’t. I think the neighbor’s dog may have had something to do with the ones that didn’t grow – they sprouted and then disappeared. The others grew tall and flowered. I haven’t harvested those yet but I have eaten some raw from another planting. They remind me of jicama – sort of sweet, starchy, and crunchy. I want to try them in stir-fry, too. Yummy! Eileen, I’ve heard from someone else who said her sunchoke tubers sprouted, then disappeared. I’m glad some of yours grew to maturity. I bet they would be good in stir fry. Thanks for the suggestion. sorry to bump an old post, but I am on the hunt for sunchokes and I know this may be a long shot but I’m wondering if you have any to share this season? No worries if you don’t! Thanks! Christine, I will have some to share. I’ll run a post when they are ready. Okay Connie, that sounds great! Thanks! 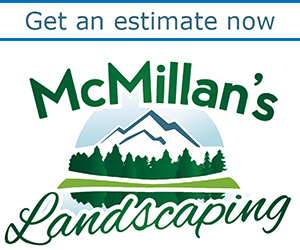 © 2013 Buffalo-Niagara Gardening. All rights reserved.